BBC One is to air a new drama from Jimmy McGovern, starring Sean Bean and Anna Friel. Broken is made by Liverpool’s LA Productions and has previously been described as a “state of the nation” piece. 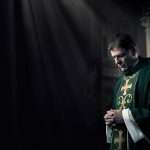 Bean is Father Michael Kerrigan, a Catholic priest in a Northern urban parish, who must be confidant, counsellor and confessor, to a community, struggling to cope with its beliefs, faced by the realities of modern day living. “The idea dates back to around 1982, when I was working on Brookside and kept pushing for a Catholic priest character,” explained McGovern. “I worked with Jimmy on The Accused and I had a wonderful time. It was one of the most enjoyable and rewarding experiences I’ve ever had, and when Jimmy came up with the idea of playing a priest I was very flattered that he should think of me to play the role. I just jumped at the chance. “I met Jimmy about two years ago in London alongside [Executive Producer for LA Productions] Colin McKeown, and he was enthusiastically throwing out ideas - acting them out in front of me - and it was just fascinating to see what he had in his head. Describing this character who did some pretty bad things - that we don’t know about at the beginning of the series - before discovering something else and deciding to become a priest. That’s how it all began. Broken airs on BBC One from 23rd May at 9pm.